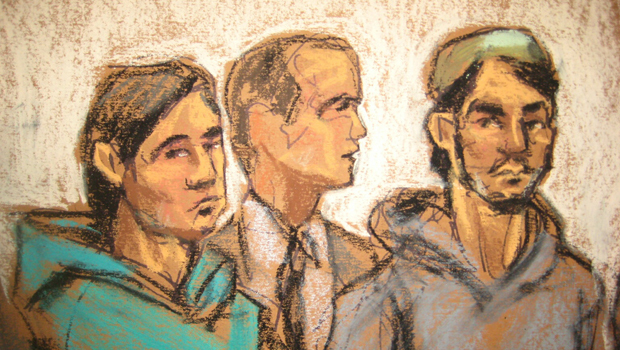 In a complaint filed in federal court, officials say the trio first came to the attention of law enforcement during the summer of 2014 after they expressed their online support for the establishment of an Islamic caliphate in Iraq and Syria. Officials allege they subsequently devised a plan to travel to Turkey and then to Syria for the purpose of waging jihad on behalf of ISIS. If they were not successful in joining ISIS in Syria, they allegedly planned to commit an act of terrorism in the United States, and one even allegedly offered to kill President Obama if ordered to do so. The three men have been identified as Abdurasul Hasanovich Juraboev, 24, a resident of Brooklyn and a citizen of Uzbekistan; Akhror Saidakhmetov, 19, a resident of Brooklyn and a citizen of Kazakhstan; and Abror Habibov, 30, a resident of Brooklyn and a citizen of Uzbekistan. Juraboev and Saidakhmetov were arrested in New York. Habibov was arrested in Florida. They are charged with attempt and conspiracy to provide material support. If convicted, each faces a maximum sentence of 15 years in prison. Saidakhmetov was arrested early Wednesday morning at John F. Kennedy International Airport, where he was attempting to board a flight to Istanbul. Juraboev had previously purchased a plane ticket to travel from New York to Istanbul and was scheduled to leave the United States on March 29, 2015. Habibov has been accused of operating a domestic support network that helped fund efforts to join ISIS, including that of Saidakhmetov. According to the complaint, "in an August 2014 posting on an Uzbek-language website that propagates (ISIS)'s ideology, Juraboev offered to kill the President of the United States if ordered to do so by (ISIS.) More recently, Saidakhmetov expressed his intent to buy a machine gun and shoot police officers and FBI agents if thwarted in his plan to join (ISIS) in Syria." "The charges against Juraboev, Saidakhmetov and Habibov reflect our commitment to finding those who wish to provide material support to (ISIS), as well as those committed to fighting on behalf of (ISIS), either at home or abroad, and preventing them from doing so," said Assistant Attorney General Carlin. NYPD Commissioner Bill Bratton described the arrests Wednesday at a press conference as part "of a number of investigations we're engaged in." FBI representative Diego Rodriguez said at the press conference they had not zeroed in on these three men, but rather their arrests came as a result of a broader effort. ISIS consists mostly of Sunni militants from Iraq and Syria, but has also drawn thousands of fighters from across the world. Officials estimated last summer that between 100 and 200 Americans had succeeded in joining the terrorist group in Syria or Iraq, but acknowledged that the exact number was very hard to pin down. Bratton said that while the size of the investigation into U.S. residents attempting to join ISIS abroad is large, he believed his colleagues in Europe had a much bigger problem.